With the start of college basketball just weeks away, we’re breaking down Michigan’s roster player-by-player. Today we look at redshirt freshman big man DJ Wilson. With the start of college basketball just weeks away, we’re breaking down Michigan’s roster player-by-player. 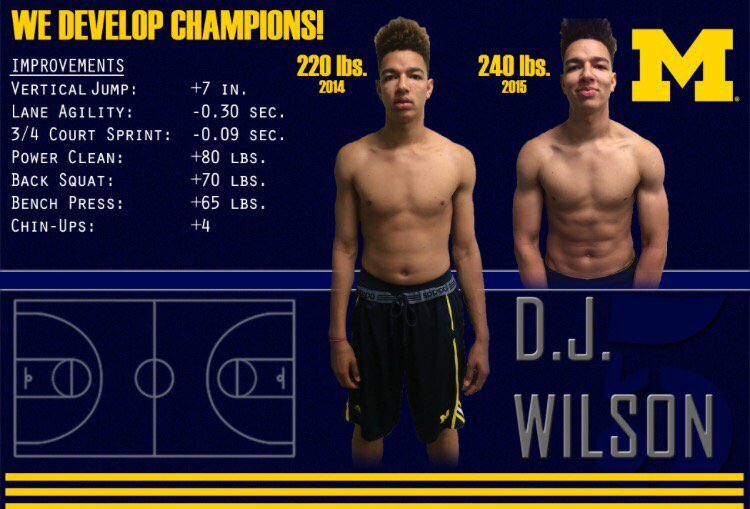 Today we look at redshirt freshman big man DJ Wilson. Previously: Aubrey Dawkins, Caris LeVert, Derrick Walton, Spike Albrecht. Anyone who saw the 24 minutes that DJ Wilson played last season probably doesn’t expect him to make an impact this season. He played 15 minutes against Division I foes and was 0-of-2 from the floor with two blocks, two rebounds and four fouls. His only made field goal in a Michigan uniform before being sidelined with a knee injury was in a 24-point rout of Division II Hillsdale College. But even for those who saw Wilson’s lack of production, his potential was obvious. Even as a 6-foot-9, 220 pound freshman with a scrawny long arms — Wilson showed promise on length alone. He suffered a knee injury and shut things down for the season and put his redshirt season to good use. Looking at Wilson now, it appears that the year in the weight room could have been the best thing for his career. Now he stands 6-foot-10, 235 pounds with a 7-foot-2 wingspan and looks like he’s ready to play Division I basketball. When Wilson committed to Michigan, he was never expected to be an instant impact player. He had missed significant time during his high school career due to several injuries (most notably a stress fracture of the fifth lumbar vertebra in his lower back) and his slender frame didn’t look ready to make an instant impact by any stretch. But the potential was there which is why he was regarded as a top-100 prospect. With a wing-span measuring in at 7-foot-2 and a solid skillset, Wilson’s best basketball was ahead of him, he just needed to realize it. The numbers in the photo above speak for themselves. After a year and a half in the gym with Jon Sanderson, Wilson increased his vertical jump by 7 inches, gained 20 pounds, improved his quickness and gained strength across the board. For comparison, Nik Stauskas added 12 pounds and 5 1/2 inches to his vertical jump after his freshman year. We aren’t quite sure where Wilson’s numbers started, but his physical development is eye-opening. Nobody is sure yet if Wilson fits into Michigan’s rotation. 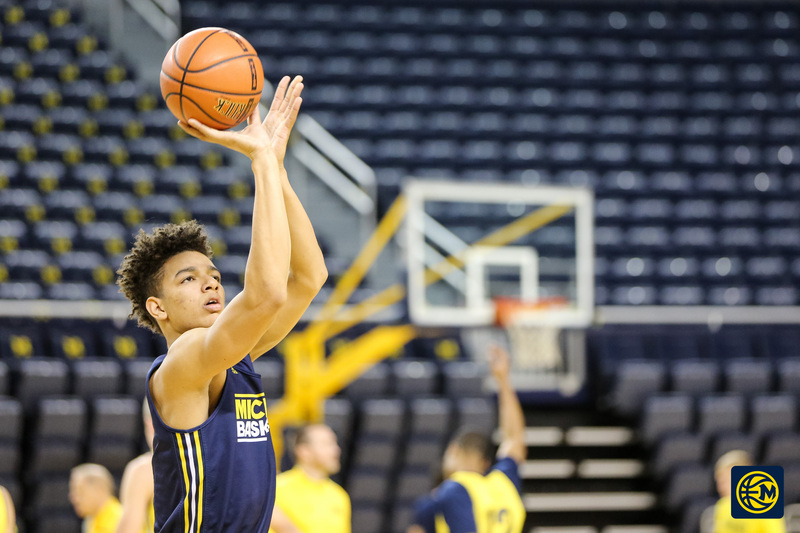 The Wolverines don’t have many spots up for grabs and we haven’t really seen Wilson play other than a few hours of light drills in practice, open gym whispers and other general preseason prognostications. In other words, not much. But the far more interesting question is if Wilson is going to be a rotation player for Michigan, then where will he play? The easiest route to playing time is at the five spot. There 40 minutes to be split between four players — Wilson, Ricky Doyle, Mark Donnal and Moritz Wagner. Doyle played significant minutes last season and is a safe bet to do the same this year, but there are definitely minutes up for grabs in the mix. It’s easy to love Wilson as a ball screen defender at the five spot. He has the length to contest and presumably the versatility to switch out onto ball handlers in the pick and roll game. The concerns about Wilson as a center grow as we get closer to the basket. Can he feasibly hold his own physically against bigger and stronger players in the post? That’s the million dollar question. At the four spot, things are much more crowded. Aubrey Dawkins and Zak Irvin both play the wing spots and look like good bets to play 30 minutes or more per game. To play those kind of minutes, one will be spending extensive time at the four. Kameron Chatman’s natural position is also four and Michigan’s guards could also be pushed up a spot if the Wolverines go with a two-point guard look. Michigan coaches say that Wilson is destined to play the four in the long-term, but does he have the necessary shooting, passing and ball-handling skills to play there this season? Michigan has never ranked better than 255th in block rate under John Beilein. Over the last seven years those numbers check in at 340th, 308th, 255th, 310th, 311th, 309th, 226th. The Wolverines have really had one true shot blocking threat, Ekpe Udoh, and he transferred after one season under Beilein. Given the fact that Wilson’s wing-span measures over 7-foot tall and he added 7 inches to his vertical leap, he has the potential to be one of Michigan’s best shot blocking threats under Beilein. The versatility, the length and the potential are likely to come down to one thing: can DJ Wilson attack the glass, box out and grab rebounds. We haven’t seen that from Wilson quite yet, but we know he has some ability. He’ll likely face a constant battle to be more physical and aggressive around the basket, especially early on this season. Michigan has never been great in the middle under John Beilein and last year was one of the worst seasons for the Wolverines inside. They struggled to defend post-up scorers and were ranked 279th in 2-point defense, 203rd in 20-point offense, 325th in offensive rebounding and 175th in defensive rebounding. Those numbers are all ugly. Simply put, Michigan needs to be better on the interior in 2015-16. Wilson has the potential to add a unique skillset to that mix, but he has to prove he can play with the physicality necessary to produce.